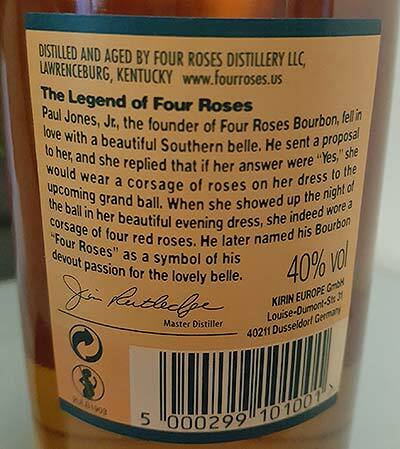 Four Roses Kentucky Straight Bourbon Whiskey, a.k.a the Yellow Label regular bourbon by Four Roses distillery. This is a legendary American whiskey, not by taste but by conspicuousness. Four Roses has to be one of the most well-known US whiskey brands along with Jack Daniel’s. 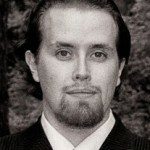 At least I’ve known it all my adult life, long before I became an whiskey enthusiast. Four Roses distillery has only two mash bills, when usually American distilleries use 3-5 mash bills for making whiskey. Four Roses Bourbon is being made at Lawrenceburg, Kentucky. Mash bills used for it contain 75% corn, 20% rye, 5% malted barley and 60% corn, 35% rye, 5% malted barley. You can check out their recipe infographic here. Four Roses Kentucky Straight Bourbon is in my opinion, nothing special, but a steady and smooth American whiskey for bargain hunters. I myself prefer Buffalo Trace, when looking for quality bourbon with a cheap price tag. But Four Roses isn’t bad either, surprisingly tasty for the price you’ll be getting it. Taste: Crispy green apples and light fruity notes. Sweet honey with a wee spicy kick from the rye. Finish: Touch of rye is present, bit spicy with honey and vanilla. Balance: Overall, an okay bourbon in its price range.